Rheumatoid arthritis, commonly known as RA, refers to an autoimmune disease where the immune system (which normally protects the body’s health by attacking foreign substances such as viruses and bacteria), mistakenly attacks the body joints. This, in turn, creates inflammation which causes the tissues that line the inside of joints (synovium) to thicken thus resulting in pain and swelling around the joints. The synovium usually makes a fluid which lubricates joints and also helps them to move smoothly. If the inflammation goes unchecked, it might damage the cartilage – an elastic tissue that normally covers the ends of your bones in a joint. Over time, there’s loss of cartilage and the spacing between bones becomes smaller. The joints can become unstable, painful, loose and even lose their mobility. Joint deformity can also occur. Joint damage can’t be reversed, and since it can occur early, health experts recommend early diagnosis and rheumatoid arthritis treatment to control the condition. Early, aggressive RA treatment. 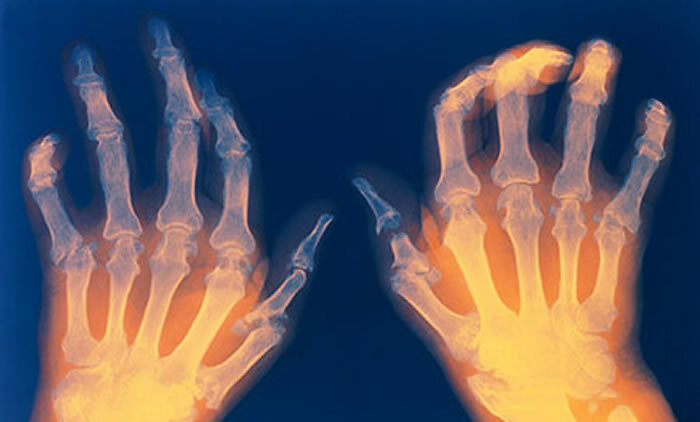 The first strategy for treating RA is reducing or stopping inflammation as fast as possible. Remember the earlier, the better. Targeting remission. Health experts refer to inflammation in rheumatoid arthritis as disease activity. The ultimate goal here is to stop inflammation and achieve remission which means minimal or no signs of active inflammation. Tight control. Getting the disease activity to a lower level and maintaining it there is what’s referred to as having “tight control of rheumatoid arthritis.” Research shows that tight RA control can prevent or even slow the pace of joint damage. There are numerous drugs used to treat rheumatoid arthritis. Some drugs are used primarily to ease the signs and symptoms of RA. Other drugs are used to slow down or stop the main cause of the disease and also inhibit structural damage. Nonsteroidal anti-inflammatory drugs, commonly known as NSAIDs, are available by prescription and over-the-counter. They are normally used to help ease arthritis inflammation and pain. NSAIDs include drugs such as ibuprofen, naproxen sodium, and ketoprofen. For individuals who have had or those who are at risk of developing stomach ulcers, the doctor might prescribe celecoxib instead. This is a type of NSAID that’s designed to be safe for the stomach. The medicines can be taken through the mouth or be applied to the skin (as a cream or patch) directly to the swollen joint. Corticosteroids: The corticosteroid medications, including prednisolone, methylprednisolone and prednisone are quick-acting and potent anti-inflammatory medications. They might be used in rheumatoid arthritis to get potentially damaging inflammations under control while waiting for DMARDs and NSAIDs to take effect. Due to the risk of side effects associated with these drugs, most doctors prefer using them for the shortest time possible and at doses that are as low as possible. DMARDs: Disease-modifying antirheumatic drugs, commonly known as DMARDs, are drugs that usually work to modify the main course of this disease. The traditional DMARDs include hydroxychloroquine, sulfasalazine, azathioprine, leflunomide, methotrexate and cyclophosphamide. These drugs can be taken orally, be self-injected or be given as an infusion in the doctor’s office. Biologics: These are a subset of the DMARDs. Biologics might work more quickly as compared to traditional DMARDs. They are injected or be given infusion in the doctor’s office. Since they target specific steps within the inflammatory process, these drugs do not wipe out the whole immune response as some other rheumatoid arthritis treatments do. In most people with RA, biologics can slow, modify or even stop the disease. JAK inhibitors: This is a new subcategory of the DMARDs that blocks the Janus kinase; pathways that are involved in the human body’s immune response. JAK inhibitors can be taken orally. Patients might never even need surgery for their RA. However, it can be a good option for people who have permanent damage which limits daily function, independence, and mobility. Joint replacement surgery may relieve pain and also restore function in joints that have been badly damaged by rheumatoid arthritis. The procedure normally involves replacing the damaged parts of the joint with plastic and metal parts. Knee and hip are most common replacements. Replacements can still be done on shoulders, wrists, elbows, ankles and other joints too, though.